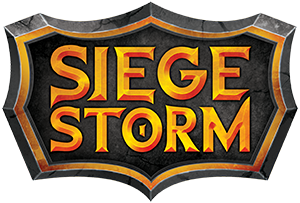 Siegestorm is a two-player collectible card game of unending assault. Two armies rush forward on two tracks, trying to deplete the enemy force in a war of attrition. No card types, counters, dice, or complex rules. Just bring the pain to your enemy! Full of pompous Elves and boring do-gooders. They Specialize in arts of protection, healing, and control. The deck offers many opportunities to draw additional cards. Just don’t fret about your resources, since you also have many healers who may return your cards from casualties pile. A faction of rotten villains. Offers many abilities that force the enemy to discard his precious cards or wreak havoc on his neatly arranged battle lines. You can even prevent him from drawing cards or freeze his track in place! And you get many opportunities to sacrifice your units for greater evil. We are supporting Siegestorm with a simple game finder that can help you find matches in your area. Gather up, play, and report your results through our mobile site to claim your place in the rankings or win some real-life plunder.